Exterior view. View to the sea. 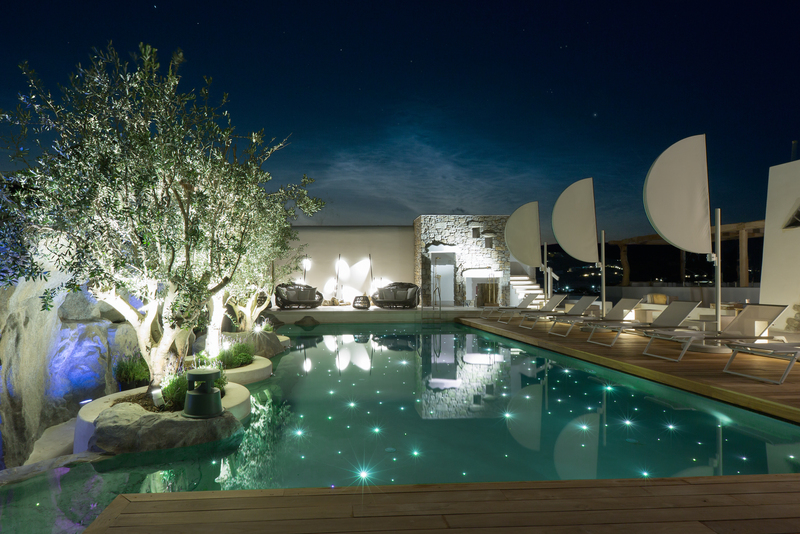 A unique "design boutique hote"», Kenshō Boutique Hotel & Suites opened its doors recently in the cosmopolitan island of Mykonos. With an innovative way, Kenshō combines the Mykonian tradition with the natural wealth of the island through a minimalistic and elegant approach. Our "hidden treasure" bedecked with unique works of art by world-renowned designers, such as Kenneth Cobonpue, Paola Navone, Patricia Urquiola and others, along with the high-quality services, create a unique experience for the visitor. 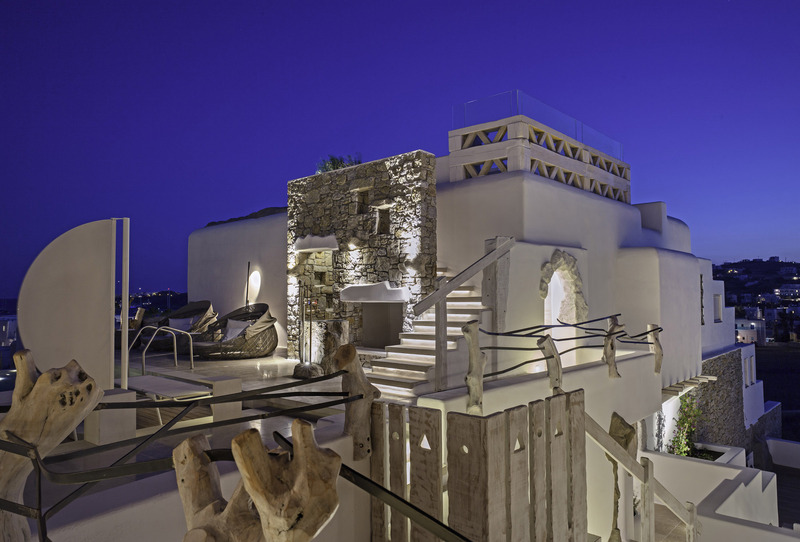 The natural stone with the aged wood blends smoothly with the Aegean architecture, recalling memories of tradition. For all the 25 luxurious rooms and 10 suites, attention to detail is a trademark for each room. Sharing the same architectural philosophy, but with a different decorative concept, the 35 "art spaces" tell their own story. All of Kenshō's dreamy accommodations feature modern air conditioning systems, complimentary WIFI, satellite HDTVs, iPads with unlimited access to music lists, Nespresso coffee machine, fully stocked minibars, fine cotton linens, Hermes luxury bath amenities, splendid bathrobes & slippers and much more. The cosmopolitan Mykonos town is waiting for you to discover its romantic small little streets and corners, using the complimentary transfers to and from Mykonos town with Kenshō's luxury cars. Many of Kenshō's rooms and suites also come complete with private plunge pools and hot-tubs. No matter the choice, at Kensho you can expect only the finest amenities in the serenity of a natural setting with the stunning Ornos Bay right outside the door. Kenshō embraces all your senses through a complete awakening experience from the moment of your arrival. Guests can enjoy an exceptional gastronomic experience at the awarded Kenshō Fine Dining Restaurant located at the roof garden, overlooking Ornos Bay. The Executive Chef George Stylianoudakis combining local ingredients with innovative recipes for a modern twist on Greek and Mediterranean cuisine offers a truly unique culinary experience. Treat your taste buds to gourmet dishes in the stylish restaurant area or pair your meals with cocktails and vivid outdoor views at the Pool, Bar and Sunset Lounge. Either way, you can expect exceptional service and the warmth of Greek hospitality to complete the one-of-a-kind gastronomic experience at Kenshō. The guests can experience moments of rejuvenation and well-being in pampered comfort at the Kenshō Spa area. For absolute relaxation the spa area offers a complimentary use of a 1 sq.m. hot tub, complimentary use of the hammam as well as a variety of massage treatments and spa rituals to choose from. For those whom training is a way of life even during their holidays, Kenshō offers a fitness area open 24/7 with the latest gym equipment. At the outdoors training area yoga lessons are taking place during sunset time in an attempt to invigorate the mind, body and soul with a holistic approach to wellness. At Kenshō, you will be greeted to a tranquil atmosphere appointed to the highest standards, receiving exceptional services by the discrete and experienced Kenshō's staff team, while it promises you an experience that awakes all the senses.